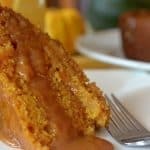 Slow Cooker Sticky Caramel Pumpkin Cake – There’s no denying that it’s time to start seriously thinking ‘pumpkin.‘ Halloween is still a few weeks away but suddenly there are gourds and pumpkins popping up all over the place. I realize this photo is only one-dimensional but even those of us with the slightest of imaginations are pretty apt to discern that the cake depicted in this single dimension has an appeal that covers all bases. And all dimensions. Let’s talk about cost. 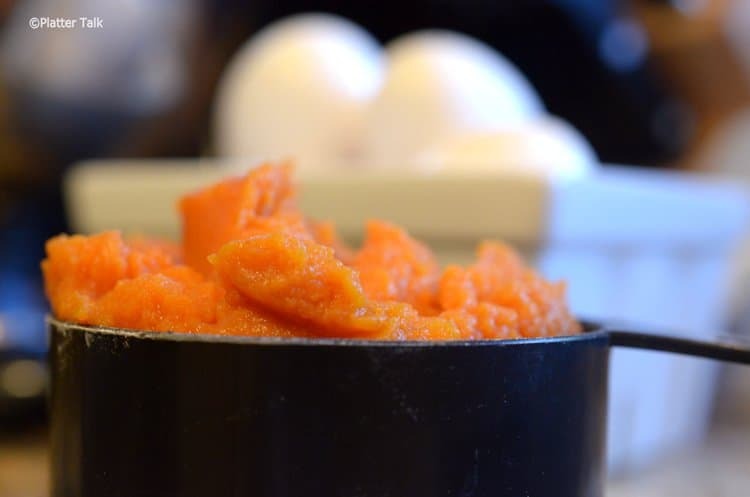 Some flour, a can of packed pumpkin, some eggs and sugar and a little butter. That’s pretty much it, none of those things are going to break the bank, I’m betting. 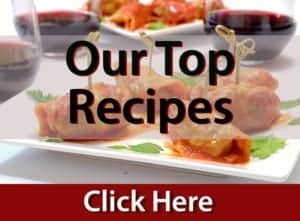 Love the ease and convenience of slow cooker recipes? 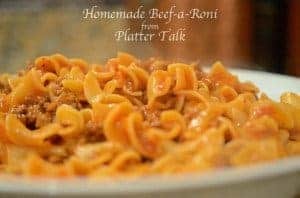 Our Homemade Beef-a-Roni is a must try! 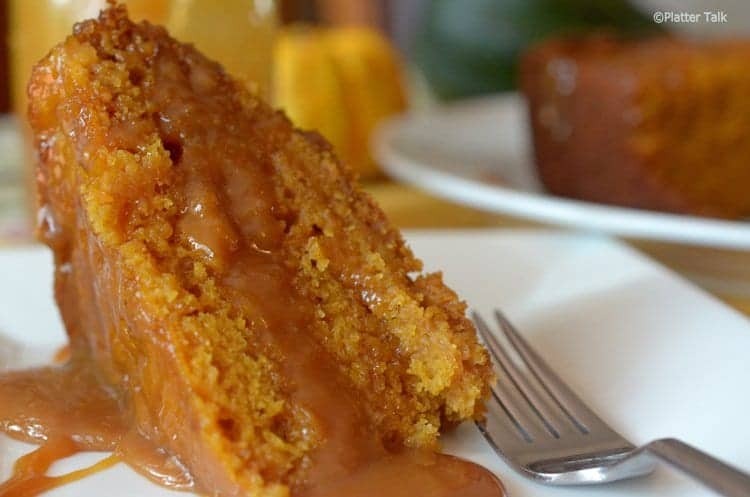 This entire recipe, with the cost of the caramel topping, is probably in the $5 to $8 range. 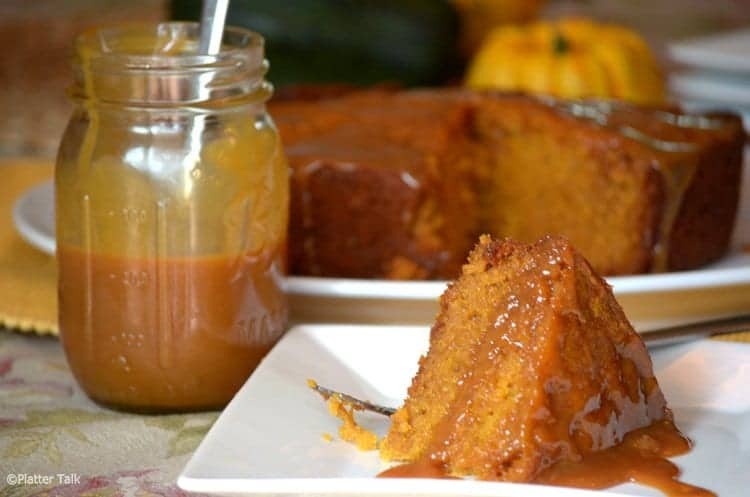 Don’t care for caramel? How about a little-whipped cream? Ice cream? Plain? Nothing wrong with that option either. Now, let’s move on to another very important dimension of cooking: Ease. This cake consists of only a few ingredients. They are simply mixed in a bowl and then scrapped into an awaiting slow cooker. Not a baker? Who cares?! Easy and no baking skill required. Check. Speaking of easy desserts with just a few ingredients, you may be interested in our 3 Ingredient Peanut Butter Cookies. A lot of people tell us they are one of their favorites! Now for one of the most critical dimensions of any food: Taste. Even when this one was “cooking” in the crockpot, I had a very good idea what this was going to to do my taste buds. Read: Go wild! 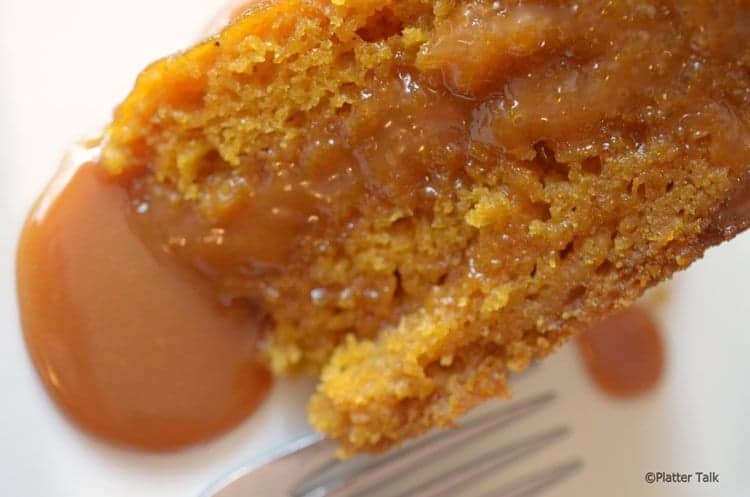 In conclusion, this pumpkin treat pretty much has it all. It’s affordable, it’s extremely easy to prepare, and it is scary delicious. 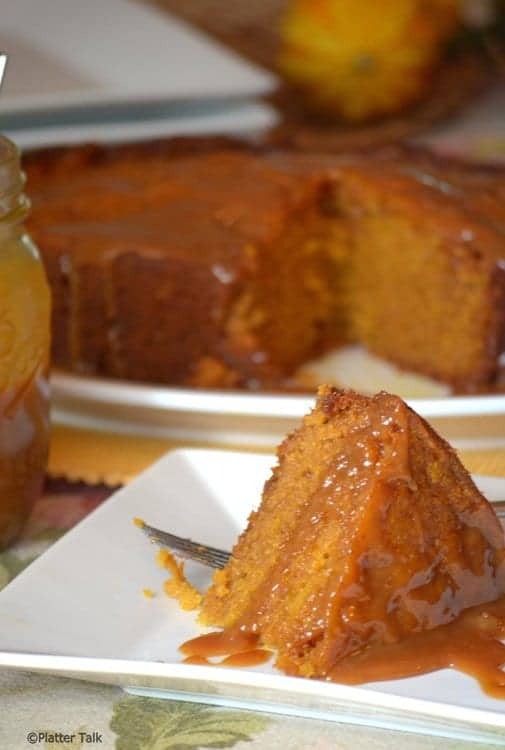 It is the perfect fall dessert for guests or family, for Halloween, Thanksgiving, or any holiday. 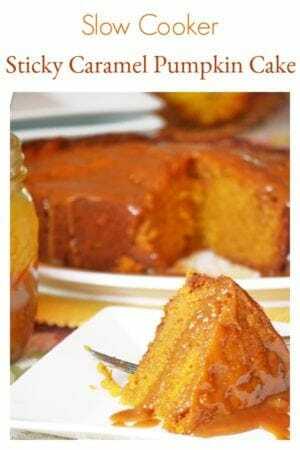 Love Pumpkin? 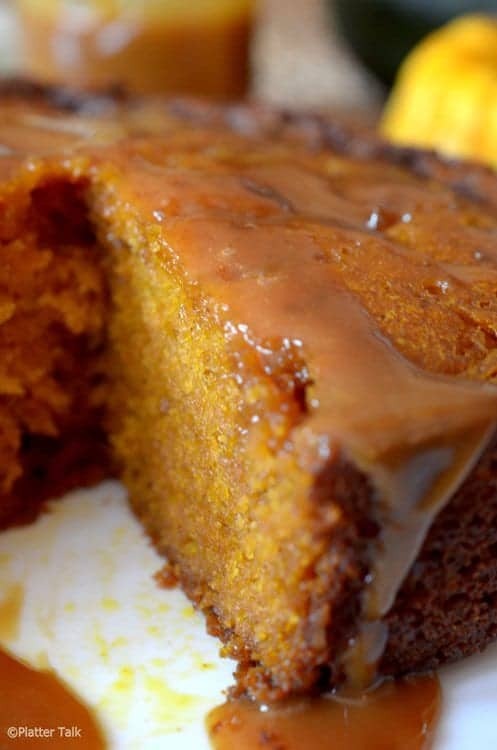 Be sure and check out ALL our great pumpkin recipes! The type of pan you have will determine how long to bake. A loaf pan will require 45 minutes, a sheet cake or double layer cake will take about 30 minutes. It is recommended that you not use a glass baking pan for this cake as metal and creamic pans seem to help keep the batter from falling. To avoid using processed (granulated white sugar), you can use 1/3 cup of maple syrup and 1/3 cup of honey. If you don’t want to use butter, readers have used 2/3 cup of sunflower oil with great success. Finally, some people have added a little extra pumpkin spice to the batter and a capful of vanilla. Try this recipe and let us know how you make it! If you love slow cooker recipes, try our Creamy Slow Cooker Chicken! 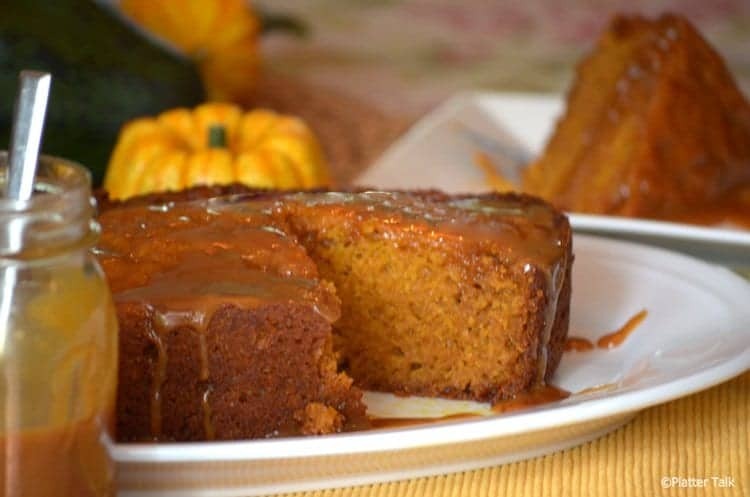 Here is a link to more Slow Cooker Cakes for you to enjoy too. 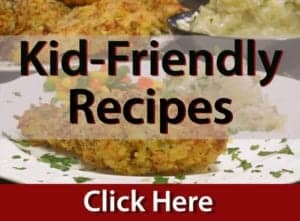 Find more great recipes here on Weekend Potluck Roundup! Also seen on Meal Plan Monday Roundup! Coat 4 1/2 quart slow cooker with nonstick cooking spray, turn to "high." Beat sugar and butter in large bowl with electric mixer for about 3 minutes, until light. Add packed pumpkin, blend until well mixed. Cook on high setting 2 hours or until center-inserted tooth pick comes out clean. Let cake stand, uncovered 10 minutes. Invert onto wire rack, invert again onto serving plate. 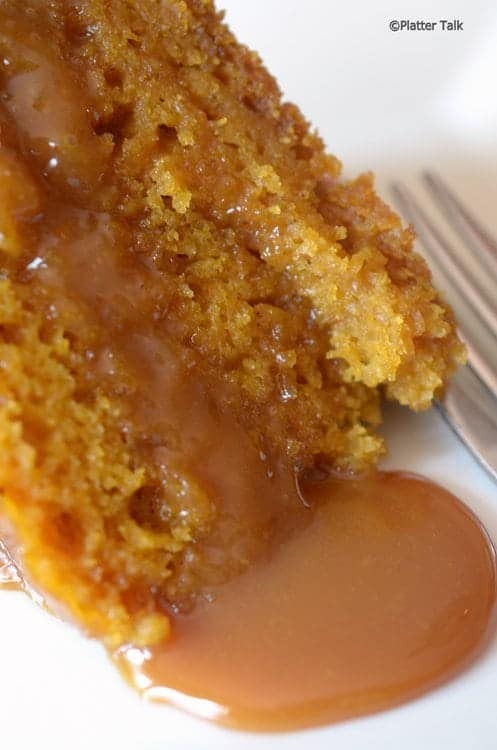 Drizzle half of caramel sauce over cake. Serve warm with additional sauce. Pin this Slow Cooker Dessert Recipe for Later. I made this recipe with a couple substitutions with what I had on hand (used up the coconut sugar last week – I generally tend not to use regular sugar since it spikes my blood a bit too much). So: instead of sugar – 1/3 cup maple syrup + 1/3 cup honey, instead of butter (I love butter, but my Man can’t do too much of that) – 2/3 cup sunflower oil, and 2 additions: 1 Tablespoon Vanilla (Vanilla shots anyone? 😉 can’t get enough of the stuff) and an extra 2 tsp. of pumpkin pie spice powder. I baked the cake in 2 separate loaf pans since I don’t have a slow cooker or a cake pan; they turned out absolutely decadent and marvelously richly moist! I baked them for 45 minutes at 350. FYI – the pyrex glass loaf pan cooks faster, so I removed it a couple minutes before the clay loaf pan I used. Also, the pyrex glass loaf pan caused my cake to flatten after I pulled it out to cool, but stayed fluffy while baking, and the clay loaf pan held the cake’s shape quite nicely = evenly fluffy throughout bake time and cool time. I love my Clay Loaf Pan! Thank you for the recipe! My Man and I are having cake for breakfast 😉 Yum! No drizzle since the cakes are sweet to our liking. Ok, maybe a little more maple syrup and honey on top (slirp, smack, and gone!). Thanks for this comment, Sabell. 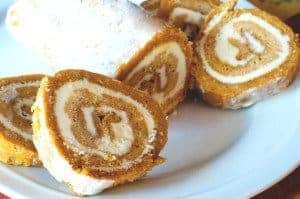 So many people have asked if this slow cooker dessert can be made in an oven and it’s something I haven’t tried yet. I think that other people have done this but you are the first person to follow-up with the results, and we really appreciate it. Thanks so much for reading Platter Talk and we hope you can find more recipes on our site that you enjoy!